Why does it seem like Christmas is so soon right after Thanksgiving? I know it’s the same date every year but time sure seems to fly these days. So with all the holiday rich foods and drinks happening now, I thought you might like a lovely little clean salad that I made up the other night – actually the night before Thanksgiving is when I first served this – the night before another eat-a-thon! It is the season for persimmons! I LOVE them and I have been using them everywhere! From pasta dishes to roasted fish to meats to salads, you name it! I love the color (orange is my fave), and they’re surprising, sweet, refreshing and oh so lovely. 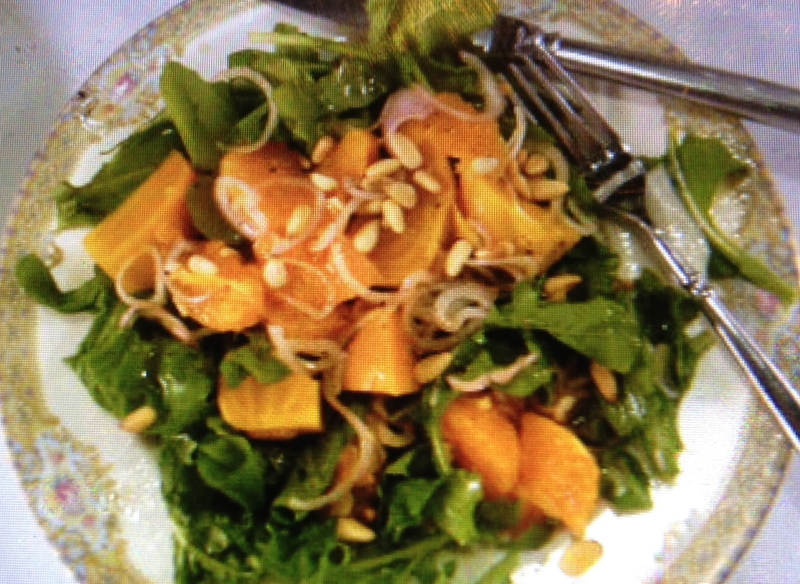 So this salad of baby arugula, shaved fresh fennel, and chopped persimmons with a champagne vinaigrette is super simple and the taste is light, crisp, fresh and sweet with a little heat from the greens – just delish! The perfect starter to clean your palate! May you enjoy this in the coming weeks to add a little health to your merriment! Divide the arugula among the four or five salad plates. Top each with the shaved fennel slices, then top with the persimmon chunks. Drizzle with the champagne vinaigrette and serve immediately. Watch people’s expressions when they think they might be eating a tomato and it turns out to be a sweet persimmon. Surprise!! With salads, I find the simpler the better. Really, the ones with the least ingredients are the best. I always remember those restaurants that try too hard – their salads give them away – with waaay too many things in them. 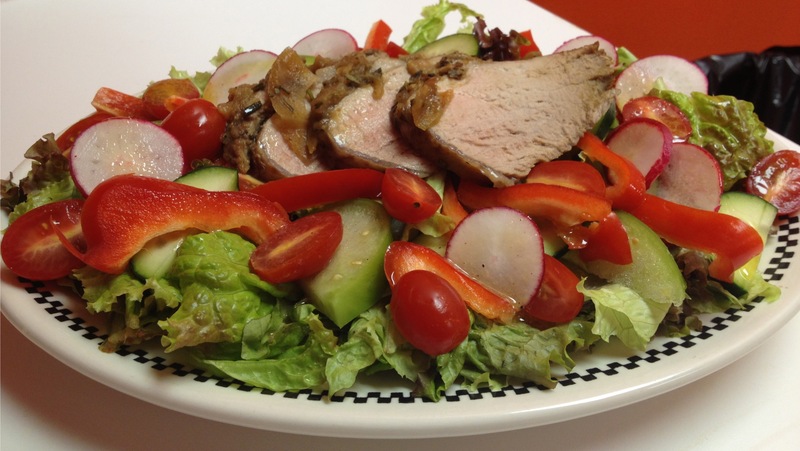 KISS (you know, Keep It Simple Stupid) works with salads too! My best blogger friend, (BBF) Maureen, of Orgasmic Chef, down under in Australia, has had vertigo and it makes me so sad. She was free from it for a little bit of time but it came back. That sort of thing is maddening. I suffered from migraines for years after our youngest, Zach, was born and it was horrible until we figured out a low blood pressure pill that prevented them. It is just terrible to be in such a state. Maureen now has our mutual blogger friend Bobbi Ann, from BAM’s Kitchen, somewhere in Asia, helping her out with tips on massage and nutrition. We’ve all never met but this is the blogging world and ain’t it grand!?! And then my other blogger friend, Suzanne, from A Pug in the Kitchen just lost her dear, dear dog, Nando. It is so hard. But, Suzanne does live in Brooklyn and WE are going to meet for lunch in late August. I am so excited!! Meanwhile, this is the longest span that I have not posted and I apologize. Just so, so much to do – all good – just crazy! And this is THE best, unique salad. Or at least I think so. I hope you will too! I had reconnected with an old friend (in person!) from our congregation in Summit, NJ. So nice to do that! And about 8 weeks ago, we had planned to have her and her husband over for dinner at our apartment in the city, at a time when both of their children (younger than ours) would be away. As I went through the grocery store several nights before, I spotted what looked good, all in the category of what I loved, trying to create an amazing new salad in my head. Here’s what I came up with: baby arugula (always a good start), topped with grilled radishes (done on the stovetop in a grill pan), fresh mango (that looked amazing! ), mint leaves (I had in the fridge from my garden) and a smattering of sliced scallions, all drizzled with a champagne vinaigrette. I thought, unusual, clean tasting (no cheese) and I always love the combination of warm and cool on a salad. This was really magnificent, if I say so myself! The sweet mango, which was perfectly ripe by the way, (her husband Steve, offered to cut it as he grew up in Thailand with a mango tree in their backyard, so he was pretty expert at those slippery things with the weird shaped pit), combined with bitter heat of the grilled radishes (I adore grilled radishes – unusual, easy and delicious – my kinda thing!) along with the burst of mint every so often coupled with the mild onion taste from the scallions, bedded with the bite of arugula and drizzled lightly with a champagne vinaigrette – it was all so yummy. My kinda heaven. I’d take two of these over dessert any day! Our friends loved it so much that she wrote that they immediately tried grilling radishes 2 days later. This is simple, but again, it’s all about the quality of your ingredients. Make sure they’re the very best you can find or don’t make it all. Place all vinaigrette ingredients in a jar. Cover tightly and shake. Taste and adjust salt and pepper. More salt will cut the tanginess of the vinegar. Even though your package of baby arugula may say it’s been triple washed, I recommend you wash it again, spin it in a lettuce spinner and then spread it out on your clean counter to air dry. You never know who’s handled it with hands that haven’t been washed and people have gotten sick. So please, always take the time to do this. You can even do this the night before and store the greens in a Ziploc bag with a sheet of paper toweling to absorb the extra moisture that will form. Toss the radishes with the olive oil and salt and pepper to taste. Heat your grill pan to medium high and grill the radishes until crisp tender with some nice grill marks. You’ll want to cover the pan for maybe 3 – 5 minutes in the middle of cooking them as they will produce a lot of smoke and using a lid will also quicken the process. Place ¼ of the arugula on a salad plate, top with the mango strips and grilled radishes as shown in the photo. Drizzle about a tablespoon of dressing over all, garnish with the mint leaves and scallions and serve with love. Wait for rave reviews. So simple, so unusual and so delicious! A wonderful combination and tangerines are in season! We all love beets in our family – after all we’re Polish and the Poles practically only have root vegetables, as my son tells me after living there for two different six month stints. Beets are served at almost every meal, along with horseradish. Soon, I’ll post our all-time family favorite recipe of beets and horseradish, as we get closer to Easter, as it is an imperative Easter breakfast dish in our household. But I digress. My brother, Mark would say, “Midge (my nickname), is this plane ever going to land?” So yes it is! This is a fantastic, surprising, most refreshing and light combination! Beets are always good with goat cheese and toasted walnuts, but this is a real treat to your palate. Now you may think it’s a lot of work and time consuming. It does take time but you can divide it up. Roast your beets the night before while you’re making your dinner, peel them and store in the fridge. Also you can toast your pine nuts the night before too. Toast more pine nuts than you need and store in an airtight plastic container so you have them on hand to throw in a pasta dish, on other salads or on some haricot verts, Remember, the more you cook, the easier it is, because you’ll start to have things on hand – salad dressings, croutons, toasted nuts. All good things! An iPhone photo of a photo on a BlackBerry! Preheat the oven to 400 degrees. Put the washed, scrubbed and dried beets in large piece of aluminum foil, drizzle with 1 tbs. olive oil and season with salt and pepper. Draw up the aluminum foil to make a packet. Place the packet in a baking dish (they might leak) and roast for 60 – 70 minutes, until they are tender and easily pierced with a skewer. When they are cool enough to handle, peel the beets and cut into sixths or eighths, or store whole in the refrigerator. In a small non-stick skillet, over medium high heat, toast the pine nuts, stirring constantly until they are golden brown. Place in a small dish to cool. Using a sharp knife, cut each end off of the tangerine so you have a flat bottom and top, then slice around the curve and cut off the remaining peel. Once the tangerine is peeled, over a medium bowl, slice in between the membranes to release the tangerine sections. Squeeze the juice from the membranes into a small bowl; you should have 1/4 cup. In another small bowl, toss the sliced shallots and raspberry vinegar with a pinch of salt and let stand for 5 minutes. Stir in the 1/4 cup of tangerine juice and whisk in the remaining 2 tbs. of olive oil. Season the dressing with salt. Place a handful of arugula on each plate. Arrange the beets and tangerine sections on plates and drizzle with the dressing. Top with the toasted pine nuts and serve. If you have refrigerated the roasted beets overnight, bring to room temperature before using. Also, the tangerines are better at room temperature as well.